If your view is from the water, it is hard to miss the old Provincetown Library. 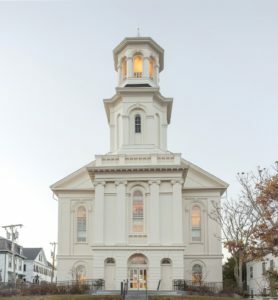 A tall, bright-white structure that interrupts the otherwise low-profile coastline, the Provincetown Library is an impressive example of mid-19th-century architecture, and it is one of few buildings in the area that has stood the test of time. Built in 1860 as the Center Methodist Episcopal Church, the structure has since been reimagined and repurposed extensively. Now, it is a library worth visiting to learn more about its architecture and history. At the height of 19th-century commercial fishing, the Provincetown port boasted a fishing industry that brought in three times the catch of any other fishing port in New England. At that time, the harbor was filled with hundreds of vessels, many of which were 90-ton schooners. A replica of the Rose Dorothea Schooner is on display in the library. The Provincetown Library schooner is an impressive 66 feet in length and dominates much of the library’s second story. A visit to the Provincetown Library will afford you the chance to see a replica of one of Provincetown’s most famous schooners and learn more about its history. Visitors of all ages are invited to coffee and bagel hour on Friday mornings and Wednesday nights, free movies begin at 6 p.m. In the summer, kids can eat lunch for free through Food for Kids, and put their creativity to task with Art on the Lawn. Spending an afternoon at the Provincetown Library is easy, especially for visitors who take advantage of all the programs the library has to offer. If free programs, a rich history, and a huge schooner aren’t enough to bring you to the Provincetown Library, the view will. Many argue that the views of the Cape Cod Bay from the upper-levels of the library can’t be beat. Swing by and pause at the windows in the mezzanine for one of Provincetown’s best waterfront views. In the heart of town and just a three minute’s walk from Admiral’s Landing, stopping by the library is as easy as visiting the Pilgrim Monument or Provincetown Town Hall. Open daily, the Provincetown Public Library hours are Tuesday-Thursday, 10 a.m. to 8 p.m.; Monday and Friday, 10 a.m. to 5 p.m.; and Saturday and Sunday, 1 p.m. to 5 p.m. While visiting the library, ask about museum passes that the library provides for other top attractions nearby. Sponsored by The Friends and Supporters of the Provincetown Library, these passes allow for free or reduced-price admission to places of interest like the Museum of Fine Arts, Boston, Massachusetts State Parks, Pilgrim Monument & Provincetown Museum, Provincetown and the Provincetown Art Association and Museum Provincetown. The list of things to do in Provincetown doesn’t stop with the library! An 1860s bed and breakfast, our rooms at Admiral’s Landing offer a relaxed and friendly atmosphere, in a convenient central location. When planning your next visit to Cape Cod, consider booking your stay with us! This entry was posted in Historic Sites, Things to Do and tagged Historical Sites, Provincetown Library, Things to Do by Admirals Landing. Bookmark the permalink.